New SX DOTZ is a professional polymer platform onto which ant and cockroach gel baits are applied. It incorporates a technology that allows it to be attached to flat, smooth surfaces without tearing or leaving any residues when removed. A targeted indicator ring guides accurate gel dosage as per product label. Its fluorescent locator ring, when exposed to black light, allows easy location in dark spaces. 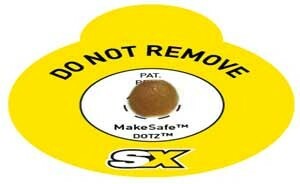 SX DOTZ are available from distributors now in packs of 240 platforms.